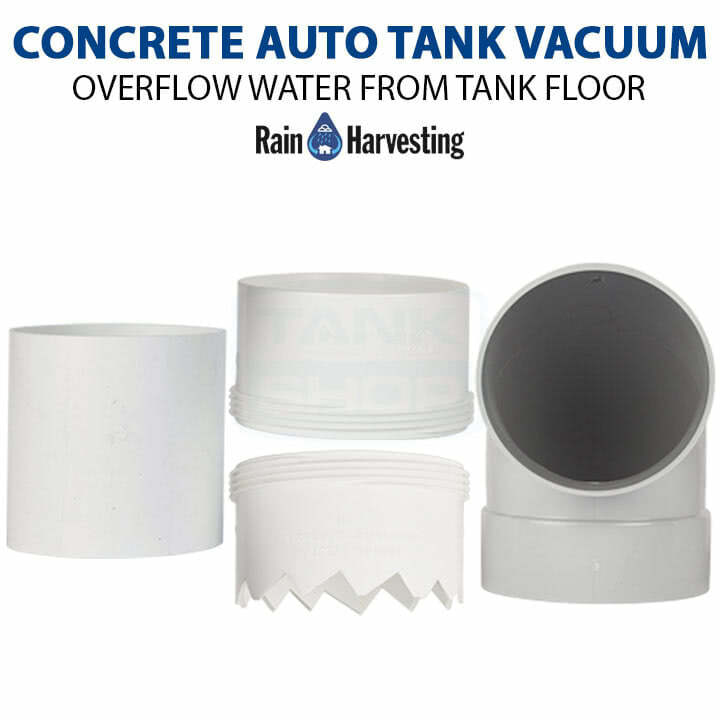 The Concrete Auto Tank Vacuum (TAVK02) saves you on tank cleaning costs and increases your tank water quality by automatically drawing sediment off the floor of your tank whenever it overflows. This model is suitable for concrete tanks. The Concrete Auto Tank Vacuum saves you on tank cleaning costs and increases your tank water quality by automatically drawing sediment off the floor of your tank whenever it overflows. This model is suitable for concrete tanks. 90 degree elbow with anti-syphon vent, 90mm threaded upper coupling, 90mm threaded toothed coupling, 90mm male pipe. If you do not have an access hole above your tank overflow outlet, your Automatic Tank Vacuum will need to be installed from the inside of your tank, which must be empty. If this is the case, ask a licensed trade professional to install your tank vacuum. Assemble the Automatic Tank Vacuum following Steps 2-5 outlined above. Please note that supplied in the 90mm Concrete kit will be a 90 degree plain elbow in lieu of the flange version. Solvent weld glue the socket of the 90 degree elbow and assembled Automatic Tank Vacuum, to the 90mm pipe of your overflow outlet on the inside of your tank. If your tank overflow uses a socket overflow outlet, utilise the short section of 90mm pipe included in your kit and use solvent weld glue to install. We recommend installing an insect-proof flap valve and Leaf Catcha or Air Gap at the pipe outlet. This will prevent pests from entering your tank via the tank vacuum and will also complement the anti-syphon vent to further prevent syphoning.